Closer Joe Nathan had his first blown save of the year when Ben Zobrist (Who really, really wants a starting job in the outfield. That’s a pretty good way to earn one) hit a solo homer to tie the game. This is the second homer Nathan has given up this year, the first was to Jim Thome in a non-save situation against the White Sox. It pains me to say this, but he will be 35 this year which means that Nathan is at the point in his career when closers tend to become more hittable. While I think he’ll still be reliable and will be well worth the money the Twins are paying him, he probably won’t be as dominant as he’s been in the past and I wouldn’t be surprised if his ERA climbs north of the 2.70 mark for the first time since the Twins acquired him from the Giants in 2003. Whether or not this leads to more blown saves will obviously depend a lot on the offense and how much run support they provide. Had the offense managed to capitalize on a few more of the scoring chances against James Shields last night, they would have had at least a two-run lead and Nathan would still have gotten the save even after giving up the home run. I just realized how dumb all of that sounds. And it’s not like I didn’t proofread before posting this, so I don’t really have an excuse. Sorry, dear readers, you deserve better than that. Speaking of the offense, Justin Morneau once again provided most of it at the Metrodome last night. He got the scoring started right away in the first, with a two-run shot to left-center field, just beyond the outstretched glove of Carl Crawford. Morneau then drove in the winning run in the bottom of the ninth on a fielder’s choice with the bases loaded. Yes, you read that right, Justin Morneau of all people beat out a double-play ball to win the game (You can see video of Morny hustling down the line here. Not bad for a guy who runs like the tin man). Akinori Iwamura couldn’t handle the chopper to second (though, in his defense, that ball was hit really hard and certainly wasn’t an easy play to make), and couldn’t recover in time to get Morneau at first. And, at least for one more night, the Twins remain the only team in the league that is undefeated in one-run games. Oh, and Francisco Liriano was pretty good last night too, scattering seven hits and giving up only two runs in 6.2 innings. He only struck out three batters, and gave up two walks, so he still struggled a little bit with his command, but was effective enough to shut out the Rays for the first five innings. Frankie was pulled in the seventh after he gave up back-to-back hits to put runners at first and second with two outs, but Matt Guerrier managed to retire B.J. Upton to end the inning with no damage done. Jose Mijares gave up a lead off walk to Carl Crawford (who then stole second), but then he settled down and struck out the next three batters he faced. Mijares has bounced back nicely from his awful spring training campaign, surrendering only one hit and one walk while striking out five since being called up last week. This is obviously very good news, since the Twins’ bullpen has been lacking a dominant reliever and were hoping that they could rely on Mijares after his stellar campaign in September. Well, there’s some good news and some bad news on the injury front. The good news is that the best hitter in the lineup will probably be back by May 1, just in time for the series against Kansas City. Unfortunately, one of the best relievers in the ‘pen is on the 15 day DL with shoulder inflammation. This is terrible news. Except for his last appearance against the Angels, Jesse Crain has been lights-out this season, and other than last year, when he was still recovering from shoulder surgery, has been dominant most of his career. Pudgy lefty Jose Mijares has been called up to take his place. Mijares was lights-out during his September call-up, then was horrible in spring training, but has been back to lights-out for the Red Wings. Which Jose Mijares we will get remains to be seen. Although, if he can work on his command, the new guy might not be so bad, either. Of course, if all of the starters could pitch like Glen Perkins, then the bullpen wouldn’t be an issue. Jason Kubel’s helmet and gloves are going into Cooperstown, after he became just the seventh player in major league history to hit for the cycle with a grand slam. Torii Hunter would like to finish his career in a Twins uniform. I agree with Howard Sinker: no thanks. This is precisely why the Royals aren’t going to win the Central this year. I guess maybe I should stop complaining about the Twins’ bullpen so much. I thought that the Royker frankenjersey was the ugliest thing I have ever seen. I stand corrected. As much as I hate the Vancouver Canucks, even I think that this is pretty funny. Well, things got off to a good start for the Americans. Brian Roberts hit a leadoff home run against Daisuke Matsuzaka. And then things kind of went downhill from there. The Japanese would score nine runs, only five of which were actually earned. Team USA’s defense was atrocious. Officially the Americans committed three errors, but unofficially it was probably closer to five or six. Obviously they didn’t want the Venezuelan record of five errors in a WBC game to stand (those commie ********!) and were trying their hardest to set a new standard in horrible defense. Either that or they simply forgot that this was a single-elimination game. Japan now gets to defend its WBC title against Korea tonight. It’s kind of disappointing that the US didn’t make it to the finals, but this should be a very good game. These two teams are powerhouses of Asian baseball, sort of like the Yankees and the Red Sox of the far east. I don’t have a particular favorite to win it all, but I guess I’ll root for the defending champs. Which of course means that Korea is going to win. I mean, look at my track record so far. The offense finally decided to score some runs in yesterday’s game against the Blue Jays. Justin Morneau had a three-run homer, his first big blast of the season. Morny had a very good day at the plate, going 2-for-2 with a walk (apparently Morny has been taking Harmon Killebrew’s batting advice). Actually, pretty much everybody had a good day at the plate, since Jays’ starter Matt Clement wasn’t very effective. 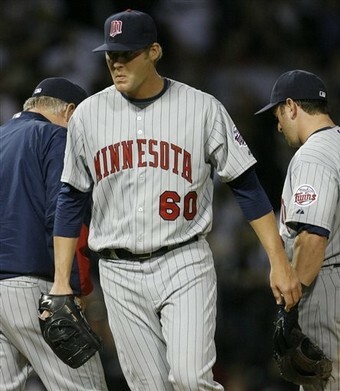 The Twins knocked the righty out after 4 1/3 innings, pounding him for nine runs on six hits. Our own Scott Baker wasn’t particularly sharp either, giving up four earned runs on nine hits in 4 2/3 innings. He didn’t give up any homers though (for once), and recorded five strikeouts and no walks. 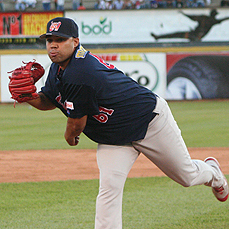 Jose Mijares continued to struggle, giving up two earned runs in 2/3 of an inning, and also injured his ankle while trying to cover first. It’s looking more likely that the lefty is going to spend the season in Rochester (although Gardy is stubbornly insisting they can turn him around before the team heads north in two weeks). This might give Brian Duensing an opportunity to make the team if the Twins decide they need another lefty in the ‘pen. Duensing has been a starter his entire career, and did struggle a bit early in the season while in Rochester last year, but has looked really good in his relief appearances during spring training. At least he can get hitters out, anyway. Owen Nolan scored a couple of goals, the Oil scored on themselves, and Niklas Backstrom made himself worth every penny of his four year, $24 million contract extension in one of the closest games the Wild have played all season. They got off to kind of a slow start in the first, though they weren’t helped by some awful officiating. Mikko Koivu got called for a phantom interference penalty on Ales Hemske (that was a beautiful piece of diving), and Dan Fritsche got called for boarding when he barely touched Ladislav Smid. I don’t normally complain about officiating, but this was ridiculous. Luckily the penalty-killers (and Backs!) stepped up to prevent any sort of ill-gotten gains by the Oilers. Marian Gaborik made his triumphant return to the ice after having surgery on his hip. Though he didn’t score any goals, it was just really good to see him out there again. Unfortunately, captain Mikko Koivu suffered a knee injury when he was pulled down by Ales Kolatik and will be out the rest of the week. He might even miss the rest of the season, which means the Wild might as well forget about playing hockey past April. Come on, Mikko. Just rub some dirt on it and you’ll be fine. I really shouldn’t mock the Canucks for this hilarious piece of epic fail. They are a lock to make the playoffs after all, and my Mild Wild will be lucky if they manage to sneak in as the eighth seed (although beating the Oil certainly helps). But there is nothing quite as satisfying as watching a hated rival do something so ridiculously dumb. Especially when your own team has been doing so many ridiculously dumb things as of late. It’s true. As Howard Sinker noted last Sunday (by the way, look who’s now on his blog roll), the Twins considered taking Manny in the third round of the 1991 amateur draft. Scout Herb Stein (who pushed the organization to draft the likes of Rod Carew and Frank Viola) was heavily urging them to draft him, but the organization ultimately decided to pass, taking first-base prospect David McCarty instead. Ramirez was drafted in the 13th round by the Indians and went on to be the greatest right-handed hitter of his generation (and arguably in baseball history), while McCarty went on to enjoy a career as a utility infielder, batting .242./.305/.351 in his eleven seasons with the Twins and Red Sox. 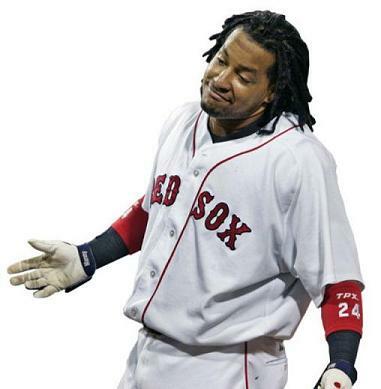 One has to wonder what the Twins’ lineup would have looked like with Manny Ramirez, though. Especially since that lineup would also have had David Ortiz. I doubt the Twins would have won any more World Series championships (Manny is not a starting pitcher, after all), but perhaps they could have been spared so many losing seasons. I’m not sure if that is such a good thing, however. The Twins would never have been able to keep either Ramirez or Ortiz if they became the offensive powerhouses we know and love. They would probably have been outbid by larger-market teams, and would have been forced to either trade each one for whatever prospects they could get (as they did Johan Santana) or simply lose them to free agency (like Torii Hunter). Worse yet, those losing seasons have helped shaped the current roster. Justin Morneau was a first-round pick in the 1999 draft (3rd overall) as was Joe Mauer (1st overall, 2001 draft). Imagine the current lineup without either one. 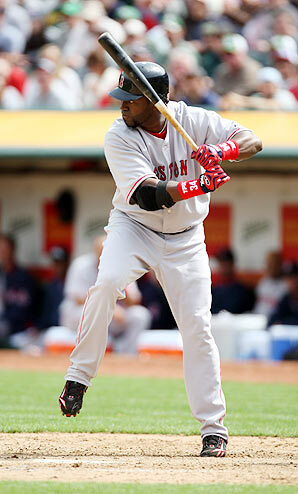 Big Papi was 2-for-3 with a two run homer against his former team in today’s 9-5 loss to the BoSox. The pitching wasn’t great on either side, though the Twins were much worse. Scott Baker was once again burned by his tendency to give up the long ball, surrendering the two-run blast to Ortiz and a solo shot to Jason Varitek. Baker gave up four runs on seven hits overall, and walked one while striking out two in three innings. Matt Guerrier wasn’t very sharp either, surrendering two two-run homers in one inning of relief. This is not good news for someone who struggled mightily down the stretch last season, and is going to have to be a key part of the bullpen this year. Jose Mijares pitched better than he has in his past couple of appearances, but he still wasn’t terribly effective. He surrendered one run on two hits and walked one in his one inning of work, though he did strike out two. Brian Duensing and Bobby Keppel were probably the most effective pitchers for the Twins, as they were the only ones who didn’t give up any runs. At least the offense has started showing some life, though. Other than Justin Morneau, that is. Johnny Canuck has been struggling a bit at the plate and he was hitless in today’s game, striking out twice. Denard Span seems to have found his swing, and went 2-for-3 with a solo homer off of Jonathan Papelbon. Alexi Casilla has been getting hot lately, too, and went 4-for-4 with two stolen bases. While I doubt the two of them will be able to maintain this torrid pace during the regular season, they should at least be good enough to keep their one-and-two slots in the lineup. Team USA rallied from a two-run deficit to defeat the Puerto Ricans and advance to the semifinals in the WBC. This was quite a game, with the Americans down two runs in the bottom of the ninth. David Wright drove in the winning runs on a single, capping off one of the most dramatic rallies in the WBC (second only to the Netherlands/Dominican Republic) thus far. Okay, to be honest I didn’t actually watch this game, as I was watching the Wild pull off an impressive rally of their own, but it sounds like it was good. And now I’m officially cheering for Team USA, which means they’ll probably get eliminated right away in the next round (I was previously cheering for the Canadians and the Dutch, after all).